8 Excerpts That Explain The Alex Rodriguez Doping Scandal : The Two-Way Newly released court documents tell a narrative that sheds light on the secret world of performance enhancing drugs in professional sports. They detail surprising actions taken by both Rodriguez and Major League Baseball to hide or uncover a major doping scheme. Yankees third baseman Alex Rodriguez in September of 2013 in Baltimore, Maryland. 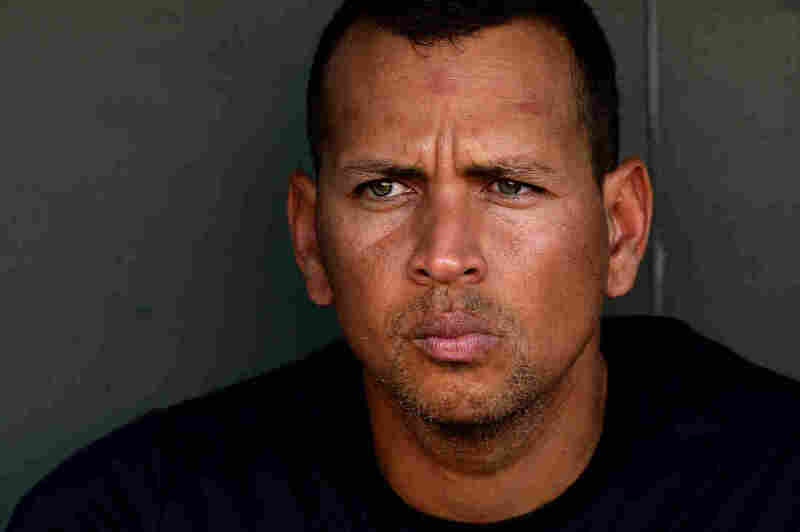 As part of baseball star Alex Rodriguez's lawsuit against Major League Baseball and the players union, a federal judge ordered the release of an important opinion from the arbitrator who found the league was justified in suspending Rodriguez for the 2014 season and postseason. The decision was supposed to remain confidential under baseball's agreement with the union, but after baseball officials talked to 60 Minutes about the case over the weekend, the federal judge ordered Fredric Horowitz's decision be made public. His decision lays down a narrative that sheds light on the secret world of performance enhancing drugs in professional sports. While many of these details have been reported before by news organizations quoting unnamed officials and people in the know, Horowitz has put this scandal into a comprehensive — and very readable — package. We've sifted through about 70 pages worth of documents and picked out excerpts that are worth reading, both because they're surprising and because they offer insight into baseball's steroids era. Before we move to the excerpts, here's the background you need to understand what's going on: This story begins in July of 2010, when Rodriguez is introduced to Anthony Bosch, who received a medical degree in Belize and operated a clinic in South Florida — known as "Biogenesis" — that allegedly provided performance enhancing drugs to about a dozen major league players. Through the years, Bosch kept handwritten composition notebooks filled with details about the drugs he was providing to different athletes. In late December or early January 2013, he noticed that those notebooks went missing. The contents of the notebooks were eventually used by The Miami New Times in a Jan. 31 story that implicated baseball pros and college athletes in an elaborate doping scheme. Baseball investigated and eventually handed down suspensions to Rodriguez and a dozen other players, including 2011 National League MVP Ryan Braun. All those players, except for Rodriguez, decided not to fight their punishments, preferring instead to apologize and serve their suspensions.